- Pre surface treatment to get the desired roughness on Industrial components before powder coating or painting. - Peeling of existing coated surface (Rejected components due to poor powder coating). - Decorative metallic components which are used in interiors. - Old Monuments, sculptures, old statues. We hold expertise in carrying out Shot Blasting Job Work, which removes metal scale and cleans the surface of parts to give them a uniformed and clean finish. The Shot Blasting job work helps in making the final product ready for painting or additional processing. We have the requisite manpower and facilities, which allow us to undertake our work with utmost precision. We are well-known entity of Sand Blasting Service. 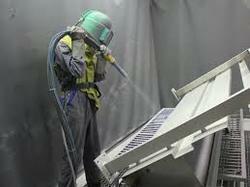 Our services are widely employed for sand blasting. In addition, professionals render this service as per patron’s demand. In this service, we use advanced machines and techniques to complete this service in proficient way. To meet the varying desires of our clients, we are engrossed in providing highly reliable Blasting Job Work. We offer various types of Shot blasting services for different products. Our expertise in blasting industry and deep knowledge on abrasive selection helps us in identifying and offering proper solution and good pricing. Our company has created a niche in the field of providing Temple Sand Blasting Service.